Q & M Medical Group offers a wide range of medical healthcare services for all age groups to look into your healthcare needs. The Community Health Assist Scheme (CHAS) is a scheme by the Ministry of Health (MOH) that enables Singapore Citizens from lower- and middle- income households to receive subsidies for medical and dental care at participating General Practitioner (GP) and dental clinics near their homes. Health Assist and Pioneer Generation cardholders can enjoy subsidies at CHAS clinics by showing your Health Assist card or Pioneer Generation card with your NRIC during registration. For cardholders below 15 years old, please present your Health Assist card and birth certificate / student ID. All Q&M Medical clinics are CHAS accredited. Kindly enquire about the services at +65 6781 3323 or visit the clinic and quote "Anonymous Test". No personal identification is required and strict confidentiality will be observed. No appointment is required. Walk into our clinic at Tampines One anytime during our opening hours and kindly request for an "Anonymous Test" at our clinic counter. You will be given a simple questionnaire to fill. No identification card is required and the questionnaire does not require any personal details. You will be given a queue number and the doctor on duty will see you when your number is called on the system. 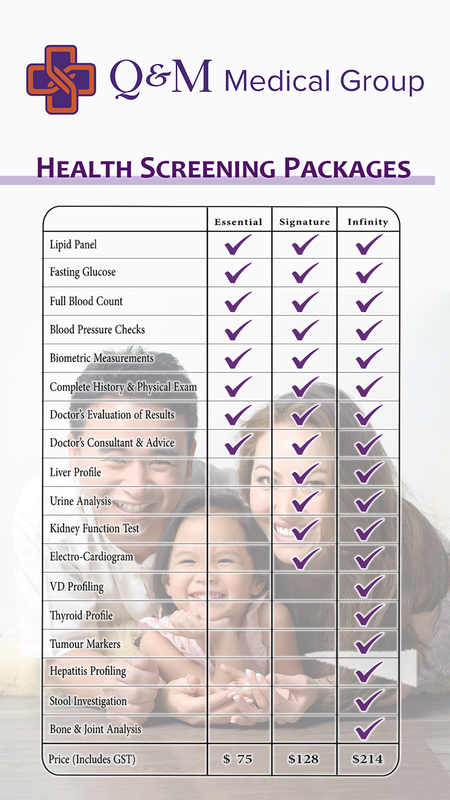 A private consultation with the doctor and the relevant point-of-care testing will be performed if required. Our doctors will not ask for your name or identification but may require intimate details during the history taking. The test requires approximately 20-30 minutes to develop and your number will be called again. A review of the results will follow.